Don’t miss the final opportunity to view “…fight IT” at Bing-Davis Memorial Gallery in Fayette. Featuring the printmaking and sculptural works of Chicago artist Eric Fuertes, the exhibit closes with an afternoon of activities Thursday, October 5. Upper Iowa University will host a printing event and closing reception for Eric Fuertes and his exhibit, “…fight IT,” at UIU’s Fayette Campus Thursday, October 5. 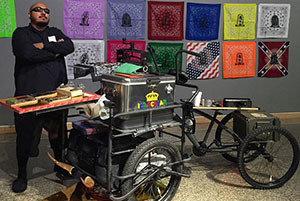 The print and sculptural artist is pictured alongside his ice cream press. The public is first invited to join Upper Iowa University students, faculty and staff during a special printing event outside the Student Center at UIU’s Fayette Campus from 11:30 a.m. – 1 p.m. Those in attendance will have the opportunity to print their own poster using the sculptural printing press design by Fuertes. In addition, the newly reorganized UIU Art Club plans to host a DJ and provide cotton candy during the event. Fuertes will later explain each of his featured sculptural presses during his exhibit’s closing reception at the Gallery from 3:30 – 5 p.m. Thursday. Bing-Davis Memorial Gallery is located in Edgar Fine Arts Hall at UIU’s Fayette Campus. The gallery is open 8 a.m. to 5 p.m. Monday through Friday. The next Bing-Davis Memorial Gallery exhibit will feature the Young Alumnus Show from Monday, October 9 – Friday, November 3. Additional information will be released at a later date.